Jackie Burke is a piece of work. 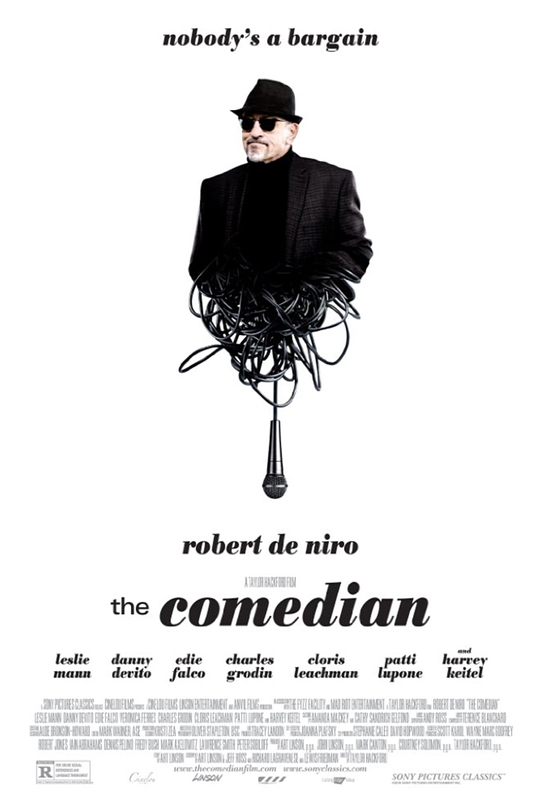 As long as you accept that the guy played by Robert DeNiro in The Comedian will always say and do something that will make you cringe, cower or cry more likely than laugh, you’ll get along with the struggling-to-find work former sitcom star just fine. When we first meet the centerpiece of this two-hour, kind-of-artsy, loosely-labeled-as-comedy film directed by Taylor Hackford and written by a near-basketball squad of Art Linson, Jeff Ross, Richard LaGravenese and Lewis Friedman, he’s performing his club stand-up routine when confronted by a heckler. Insults turn to worse, and surly, stubborn Jacob Berkowitz ends up serving a month in jail and sentenced to 100 hours of community service as sentence for his assault conviction. Dishing food to the homeless, he meets an emotionally surfing fellow server played by the wonderful Leslie Mann. That starts an interesting relationship in which they lean upon each other for support in many things family as Jackie Burke professionally tries to make everybody forget that his star peaked decades ago as sitcom star Eddie and Harmony Schlitz attempts to wiggle out of the grip of her overbearing father. Harvey Keitel makes the most of his screen time with a tan and a snarl. Jackie is one of these stand-up performers who’s as foul-mouthed as they come, and that means something in this iPhone-YouTube-cable network world. His hard-working, daughter-of-previously-fired-dad agent attempts to get him the connections to make the most of his talents. Edie Falco stays understated. In fact, the film rises from the good work in small parts. Danny DeVito is smart as Jackie’s beleaguered brother, and Patti LuPone pulses as his angry sister-in-law. At the Friars’ Club, Charles Grodin and Cloris Leachman do good as members and memorable roast members. But DeNiro, no surprise, is the star as the stormy, surprising Jackie, following his own compass and coming up with some pretty memorable direction. Watching on the living room flat screen with my dear wife Karen, I appreciated it not for the ha-ha, but for the a-ha.